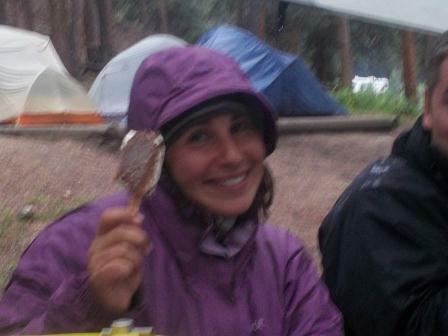 When you're out backpacking all day, your body burns large amounts of calories to sustain its energy expenditure. Because of this, food can become somewhat of an obsession. 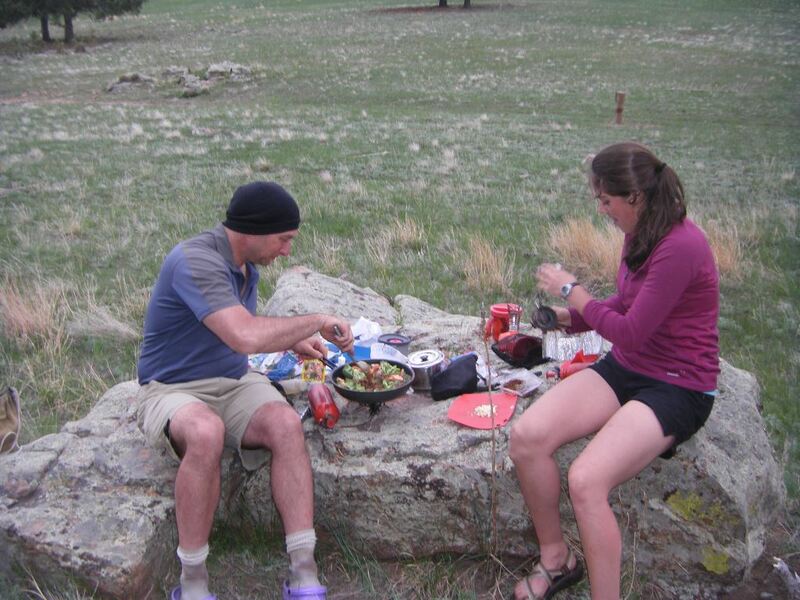 It's difficult to describe just how satisfying a hot meal can be after a long day of hiking. 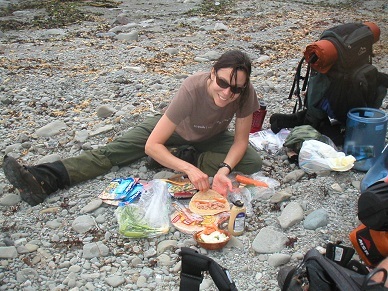 In fact, you may actually remember certain trail meals more fondly than dinners you've eaten at a fancy restaurant after a sedentary day at the office. Our meals are subject to 4 constraints: Tasty, Lightweight, Healthy, and Non-Perishable. Stir-fry is tasty and healthy, but it's heavy to carry and can spoil quickly. Mac-n-cheese is tasty, lightweight, and non-perishable, but most people wouldn't consider it the healthiest meal ever. Grits are lightweight, healthy, and non-perishable, but not everyone thinks they taste great. So each meal is an amalgamation of compromises between these constraints. We don't believe in dieting. You must feed your body in order to carry 40 pounds through the mountains all day. We eat small amounts frequently. This doesn't mean to overeat (you can only eat what we're carrying anyway) just don't starve yourself and collapse on the trail. Note: There will be no food in our tents at night (it attracts animals) so there are no "overnight snacks". We will accomodate most special requests when it comes to menu planning, from the serious (peanut allergies) to the whimsical (no watermelon). Most of our food is vegetarian, but we can also accomodate vegans. We always bring along some jerky, pepperoni and/or salami as a supplement for non-vegans. We can provide a gluten free menu for those who actually have Celiac or even for those that just saw a Facebook post disparaging gluten. Mac & Cheese w/sun dried tomatoes, parsley, carrots, and peas. Breakfasts are usually hot, cooked breakfasts or breakfasts that require only hot water. Occasionally we have cold breakfasts -- typically cold cereal -- that do not require much in the way of preparation or clean-up, however hot tea/coffee/cocoa are part of every morning. 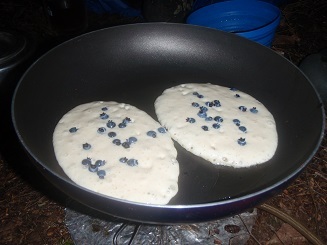 Expect cold breakfasts on days when we must break camp early to get long mileage in or on the last day of a trip when we are motivated to get back to civilization. Every trip's menu is augmented by Trail Mix. 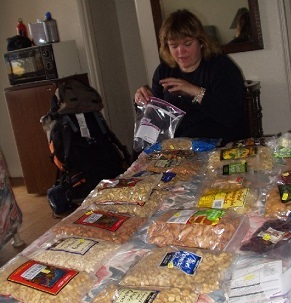 Trail mix is a mixture of proteins, starches, carbs, sugars, and salt and is typically eaten at rest stops. However, it can be eaten any time of the day to supplement your diet or as an alternative to meals that don't appeal to your palate. The day before setting out, we will make our own trail mixes consisting of your own personal mixture of the following items. Ingredients will be subject to availability in the locale of the trip, thus some of these items may not be present on every trip, while others that are not listed here may be. 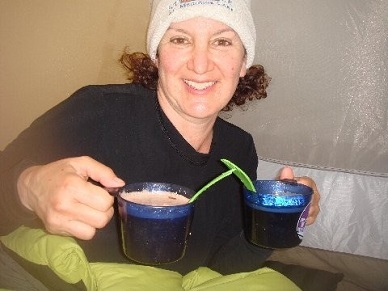 Many people drink only water when backpacking. It's a good way to break your caffeine addiction and it just feels "clean" somehow. Also, the more water you drink, the better your body burns fat. However, it's unrealistic to expect anyone to give up caffeine, especially because of the good short-term feelings it can provide as well as prevention of the withdrawal symptoms it averts, so coffee and hot chocolate are staples.